Lynx Software Technologies is a leading provider of hard real-time operating systems and secure hypervisors for avionics, aerospace and defense applications. Our technology has a proven record of safety, security and reliability and has been incorporated into a vast number of applications. Companies and institutions that have based projects on Lynx technology include NASA, Boeing, Raytheon, General Dynamics and the US Armed Forces. 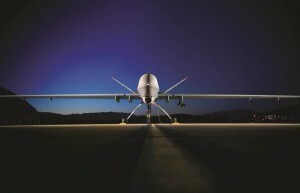 Unmanned systems require software platforms that are reliable, secure and highly compact. LynxOS hard real time operating systems are specifically designed for such resource constrained safety and security critical environments. The LynxOS real-time operating system provides a powerful, small-footprint kernel and support for multi-core/multi-threaded processors, including the latest Intel and PowerPC architectures. LynxOS 7.0 now includes military-grade security functionality built-in to the RTOS. These security features include access control lists, audit functionality, quotas, local trusted path, account management and OpenPAM, which are designed to protect the unmanned platforms from unauthorised and adversarial access. All of the RTOS components within LynxOS offer hard real-time capabilities, ensuring that they respond within a known, extremely short period of time. This deterministic response, made possible by the kernel’s unique threading model, ensures that LynxOS will perform complex tasks within a set timescale even when faced with intensive I/O activity. A fast boot time is a key feature of LynxOS. LynxOS provides a native API with full POSIX conformance, allowing for easy portability of existing Linux, UNIX and Solaris applications. With no new proprietary methods to be learned, and without the encumbrance of GPL, developers will save valuable time in bringing applications to market. LynxOS-178 is the first and only real-time operating system that provides both full POSIX conformance and ARINC 653-1 Application Executive (APEX) support and is also the only RTOS certified to the DO-178B Reusable Software Component standard. Designed specifically for multi-process and multi-threaded mission-critical applications, LynxOS-178 is also one of the few COTS solutions supporting both Intel and PowerPC architectures. ARINC 653-1 Virtual Machine brick-wall partitions allow processes to utilise separate pre-allocated memory segments and fixed hardware resources, ensuring that system events in one partition cannot interfere with events in another. LynxOS-178 provides over 300 Safety and Security APIs for the Future Airborne Capability Environment (FACE) standard. FACE defines a reference architecture for creating a common operating environment to support applications across multiple Department of Defense avionics systems. This allows for increased software reuse capabilities, saving millions of dollars and many man-hours of development and testing. 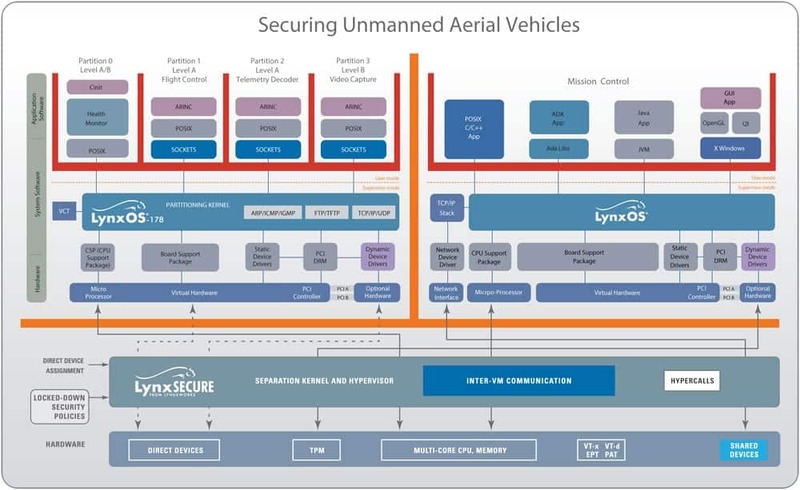 LynxOS is also compliant with the technical reference model of the UCS (UAS Control Segment) Architecture. The LynxSecure separation kernel hypervisor provides a secure environment within which multiple dissimilar operating systems can be run on one physical hardware platform. Safety and non-safety critical components can be securely separated, eliminating the need for physical gateways to bridge between these two domains and allowing significant cost and space savings to be made on an embedded application. LynxSecure’s unique virtualisation technology runs off-the-shelf operating systems such as Linux and Microsoft Windows, proprietary operating systems often found in DoD systems, as well as the LynxOS and LynxOS-178 RTOSes. It provides each operating system with an isolated partition and dedicated CPU time, memory space and I/O peripherals. Multi-level secure systems can be easily created with no compromise of security, reliability or data. LynxSecure is highly scalable, providing potential solutions for embedded applications ranging from unmanned avionics systems to weapons and large-scale infrastructure control systems. It’s separation kernel architecture allows secure isolation between safety-critical components and non-safety critical components, so any fault or malicious attack from the unsafe environment cannot spread to the safety critical domain. By submitting this form, you consent for your details to be sent to Lynx Software Technologies and its authorized partners in order to respond to your inquiry. Depending on the location of the organization, your personal information may be transferred and processed outside of the European Economic Area.